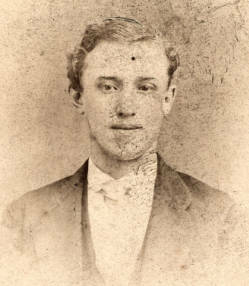 Biography & Genealogy: William Guion Childs, Class of 1870. Genealogy: Born- Oct. 2, 1850 in Lincoln Co. NC. Father- Lysander D. Childs; Mother- Nancy Hoke; Pat. Grandfather- Eben Childs of Boston, Mass. ; Pat. Grandmother- Elvira [maiden name unknown], also of Boston. Mat. Grandfather- John Hoke of York, Pa.; Mat. Grandmother- Barbara [maiden name unknown] of Lincoln Co. NC. Marriage: To Alice Eliza Gibbes, daughter of Dr. Robert W. Gibbes of Columbia, SC on September 2, 1872. Children- 1- Eben Alston Childs; 2- Edith Childs; 3- William G. Childs; 4- Nancy Hoke Childs; 5- Alice Childs; 6- Lizzie Childs; 7- Eugenie Childs; 8- Hoke Childs; 9- Mary Thomas Childs; 10- Ellen Childs; 11- Robert Gibbes Childs. Additional genealogy: William and Alice were the grandparents of Gen. William Childs Westmoreland, U. S. Army. Their daughter Eugenie (b. 4 Mar 1886 d. 9 Jul 1967) married James Ripley "Rip" Westmoreland (b. 8 Oct 1876 d. Dec 1964). Eugenie and James were the parents of General William C. Westmoreland (b. 26 Mar 1914 d. 18 Jul 2005). VMI Record: Entered VMI from Columbia, SC on Sept. 10, 1866; Graduated July 4, 1870 standing 10 in a class of 52. Careers: prominent businessman & banker; involved in railways, cotton mills, and utilities in the Columbia area. Death: May 2, 1912, Columbia.